This chapter offers a theoretical analysis related to the eXtensible business reporting language (XBRL), a freely available computer language that has become the de facto standard for digital financial reporting. The aim is to deepen the role that XBRL could play within the public sector, which is partially different from its role in corporate reporting. Literature about that topic is lacking, and this research topic seems to be particularly relevant: considering the strong need for information transparency in government, strengthened by the financial crisis, XBRL could be a useful digital tool to push and improve governments' accountability and transparency. Finally, the authors briefly present the Italian case: after the experimental period conducted by the Court of Auditors from 2013 to 2015, and since the end of 2016, XBRL has been the mandatory format for submitting the financial statements of all public entities to the Italian Ministry of Economy and Finance. In recent decades, the public sector has been involved in many modernization processes worldwide concerning several organizational, managerial, and financial aspects in an effort to recover efficiency and effectiveness as well as improve public transparency and accountability. Within these processes, technology plays a significant role. 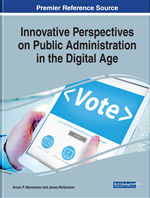 In the early 2000s, the e-government phenomenon exploded, leading to the use of new digital technologies, in particular Information and Communication Technologies (ICTs), which are used to improve government processes and to deliver public services (Aikins, 2012; Walther et al., 2016). The lack of financial transparency and accountability is assumed to be one of the main causes of the financial crisis that began in 2008. Governments have been called on to reinforce their own credibility, rebuilding the trust of the citizen taxpayers, markets, and investors (Sapienza & Zingales, 2012). The recent negative events have made clear the importance of the governmental role in financial reporting and identified a compelling and urgent need for governments to address seriously and rapidly the quality improvement of their whole public financial management systems in order to protect both the public interest and government bond investors. There are widespread calls for more rigorous and transparent financial reporting systems that will improve government decision-making and accountability, enhance global fiscal stability and sustainability, and support the ability of monitoring and meeting government commitments now and in the future. Governments should provide clear, consistent, and comprehensive information regarding the economic and financial consequences of their political decisions. Furthermore, raising funds through debt markets and considering that banks and private investors hold governments’ debt, there is a strong demand for financial transparency and accountability from the public sector just like that expected from the private sector, along with comparability. Governments definitely have a public interest obligation to investors and potential investors to provide timely, detailed, and reliable information concerning their financial performance and positions. In other words, the financial crisis has clearly demonstrated that the lack of transparency in government financial reporting is a real threat to economic, political, and social stability. Within this context, the focus of this chapter is on the eXtensible Business Reporting Language (XBRL), which is the markup language of business financial reporting that is used all over the world. In particular, the aim of this study is to conduct a theoretical analysis concerning the role that XBRL could play within public sector financial reporting. At the moment, in different countries (e.g., Australia, Belgium, Brazil, Canada, Chile, China, Colombia, Denmark, France, Germany, India, Indonesia, Israel, Italy, Japan, Luxembourg, Mexico, Peru, Singapore, South Korea, Spain, Sweden, United Arab Emirates, United Kingdom, and United States), XBRL is either mandatory or voluntarily adopted for different kinds of financial and regulatory reporting (i.e., filing required by prudential and securities regulators, business registers, and tax authorities) over all business sectors. It is considered a means to improve transparency, effectiveness, and timeliness of financial reports and to achieve efficiencies, as some recent theoretical and empirical studies point out (Hodge et al., 2004; Roohani et al., 2009; Chen, 2012; Debreceny et al., 2010; Yoon et al., 2011; Perdana et al., 2014; Birt et al., 2017; Cong et al., 2017; Liu et al., 2017). However, the same is not true for public entities and their financial reporting. Literature about that topic is lacking (Abdolmohammadi et al., 2002; Rezaee & Turner, 2002; Ball, 2007; Kull & Abraham, 2008; Chen, 2013; Mousa, 2013; Soverchia, 2015; Bonollo, 2017; Fradeani et al., in press), and the following research topic seems to be particularly relevant: considering the strong need for governments’ information transparency strengthened by the financial crisis, XBRL could be a useful digital tool to push and improve governments’ accountability, information transparency, and comparability. As for corporate reporting, using XBRL could also help prevent or avoid future crises (Karamagioli et al., 2014; Anthopoulos & Siozos, 2015).